CAMARILLO, Calif., May 31, 2018 – Semtech Corporation (Nasdaq: SMTC), a leading supplier of analog and mixed-signal semiconductors and advanced algorithms, discusses the value and key benefits of LoRa® devices and wireless radio frequency technology (LoRa Technology) in the IoT M2M Council (IMC) webinar, “Choosing the Right LPWAN Solution for Your IoT Application,” on June 7 at 8:00 a.m. PT. Vivek Mohan, Director of IoT for Semtech’s Wireless and Sensing Products Group and published author of IoT, will emphasize the flexibility and scalability of LoRa Technology that allow users to collect a range of data from sensors to develop intelligent business decisions. LoRa Technology, with its long range and low power capabilities, is an ideal IoT platform and Mohan will discuss its efficiencies in several use cases, such as up to 30% water reduction for commercial farms and up to 20% in overhead cost savings for smart parking. The panel will include IoT leaders from Tata Communications and MultiTech. “Semtech’s LoRa Technology gives enterprises the ability to develop an infinite amount of use cases that need long range and low power capabilities,” said Vivek Mohan. 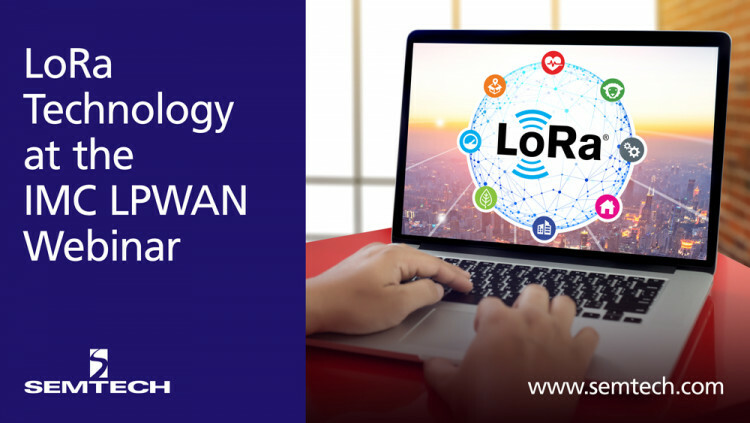 “The IMC webinar is an opportunity for the industry to understand the unleashed capabilities of LoRa Technology and the LoRaWAN™ open standard to massively transform industries. LoRa Technology provides a competitive advantage to customers by offering a platform that is adaptable and flexible for multiple markets. Register for the free webinar on the IMC website. All statements contained herein that are not statements of historical fact, including statements that use the words “will,” “to develop,” “to transform,” “designed to,” or other similar words or expressions, that describe Semtech Corporation’s or its management’s future plans, objectives or goals are “forward-looking statements” and are made pursuant to the Safe-Harbor provisions of the Private Securities Litigation Reform Act of 1995, as amended. Such forward-looking statements involve known and unknown risks, uncertainties and other factors that could cause the actual results of Semtech Corporation to be materially different from the historical results and/or from any future results or outcomes expressed or implied by such forward-looking statements. Such factors are further addressed in Semtech Corporation’s annual and quarterly reports, and in other documents or reports, filed with the Securities and Exchange Commission (www.sec.gov) including, without limitation, information under the captions “Management’s Discussion and Analysis of Financial Condition and Results of Operations” and “Risk Factors.” Semtech Corporation assumes no obligation to update any forward-looking statements in order to reflect events or circumstances that may arise after the date of this release, except as required by law.